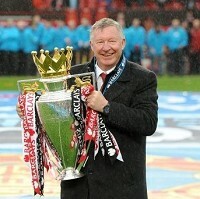 During his 27 years as manager of Manchester United football legend Sir Alex Ferguson won more honours than virtually any other boss in the sport's history. But the man who led his team to 13 Premier League titles says he still found it a huge honour to officially open a pioneering new health unit in the city where he worked for so many years. And, having lost both his parents to lung cancer, opening the bronchoscopy unit at the Wythenshawe Hospital-based North West Lung Centre was particularly poignant for Fergie. The 73-year-old said he was well aware of what a devastating disease lung cancer can be, adding that he was just sad his parents - Alexander and Elizabeth -- hadn't had the benefit of what is available to patients today. Sir Alex said the unit would offer a world-class service and help improve treatment for lung patients across a region which has a "particular struggle" with such conditions. Bronchoscopy is a procedure performed by specialists to help diagnose and treat a variety of lung and airway-related conditions. Each year in the UK around 44,500 people are diagnosed with lung cancer. Patients who go on holiday can cover themselves with a cancer travel insurance policy. Officials say the state-of-the-art unit will enable the number of patients that can be treated at the centre to be trebled. Housed in the hospital's £1 million Lucis Building, it is thought the centre is the first and biggest of its kind in the UK. The centre's clinical director for respiratory medicine, Professor Ashley Woodcock, says the new unit will significantly improve treatment options for the region's lung patients. Opening the unit, he adds, forms part of the University Hospital of South Manchester NHS Foundation Trust's drive to transform the outcomes for patients with lung cancer and other bronchial conditions. Sir Alex, who won 49 trophies during his career as a manager, lost his father Alexander, 66, to lung cancer in 1979 and his mother Elizabeth, 64, to the same disease seven years later.